When you roof starts to leak and you need roof replacement or even just simple roof repair it’s always best to use qualified roofing contractors in Hartland Michigan. Livingston Roof Pros is a fully qualified and licensed roofing contractor in Hartland and we offer full service roofing which includes roof repair and roof replacement. Learn more about the services we offer in Hartland Michigan and surrounding areas in this article. There are lots of things that can happen to your home’s roof. Even a newly installed roof can fail under the right conditions. Things such as storms with high winds can damage roofs or falling tree branches can cause damage. Having a problem with your roof means you’ll need to get it repaired quickly. Not having a roof repair done can leave your home open for damages from water leaking from the roof. This can affect ceilings and walls and even the furniture in your home. That’s one reason why it’s so important to get the best roofing contractors in Hartland Michigan to come to your home and make roof repairs. When your roof starts to leak then finding a fully licensed and qualified roofing contractor in Hartland Michigan to handle the roof repair is simple. All you’ll need to do is call Livingston Roof Pros at (517) 940-8770 or send us a message on our contact page. We can repair your home’s roof or replace it to keep the weather outside and your home and family safe. At Livingston Roof Pros we offer very competitive rates and have an extremely high level of customer satisfaction. If fact, we make sure each and every one of the projects we complete have a fully satisfied customer, it’s part of our satisfaction guarantee on all roofing projects we do. We can repair your home’s roof or replace it to keep the weather outside and your home and family safe. At Livingston Roof Pros we offer very competitive rates and have an extremely high level of customer satisfaction. Maybe your home just needs a simple roof repair. If so, Livingston Roof Pros can offer those services to you as well. From small roof repairs to large roof repairs we can help you get your home’s roof fixed quickly and we’ll also ensure it’s repaired professionally. In fact, if there is an emergency situation that has occurred on your home’s roof be sure to call the best roofing contractor in Hartland Michigan Livingston Roof Pros for emergency roof service. Our response time is usually less than one hour and we may be able to apply temporary barriers on your home to protect it. When your roof needs to be replaced completely Livingston Roof Pros can offer several options for the roof replacement. We offer full roof tear offs with a new roof installation in Hartland Michigan and surrounding areas. We also offer re-roofing in Hartland Michigan as well. At Livingston Roof Pros we can completely install the new roof on your home from start to finish and include cleanup and debris removal plus we are certified roofing contractors in Hartland Michigan so all manufacturer’s warranties are typically included depending on the style and brand of roofing you choose. Taking care of your roof means getting an annual roof inspection in Hartland Michigan. A roofing inspection can help to identify and deal with those small problems before they become large problems which can destroy your entire roofing system. At Livingston Roof Pros we offer a roofing inspection services in Hartland Michigan that can locate these small problems and repair them before they damage areas of your roof or the interior of your home. A roof inspection and maintenance schedule needs to be done at least annually for best results. One thing that really sets Livingston Roof Pros above our competition is that we offer free roofing estimates in Hartland Michigan and surrounding areas. 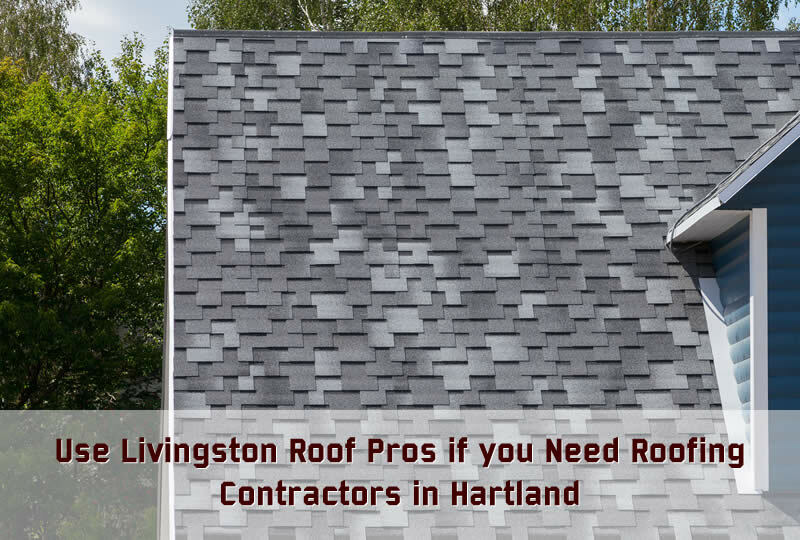 So if you need roofing contractors in Hartland Michigan be sure to give Livingston Roof Pros a call today and learn more about all our roofing services.